RAF Germany's Lightnings patrolled the East/West border and stood guard against those darn Russkies for a good while. It's good to see that a few have been preserved there in memory of those days. The one above is XN730 in 92 squadron markings at the Luftwaffenmuseum (formerly at Uetersen, now at Gatow) and looks to be in good shape, though her paintwork is fading a bit since her repaint in the late 1990s and her nosewheel oleo has bled out to leave her sitting a bit nose low. 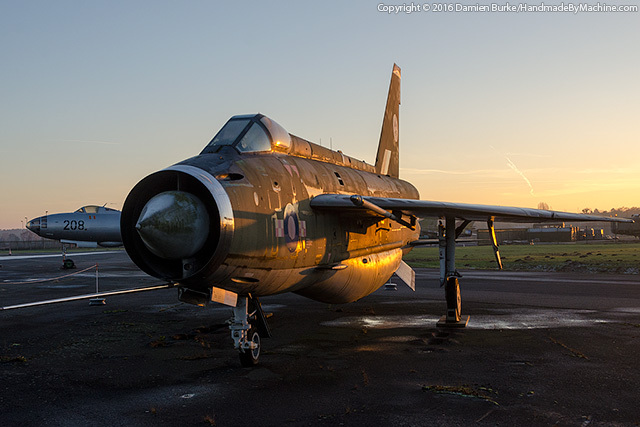 XN730 first flew on 23rd November 1961 as an F.2 and entered service with 19 Squadron in March 1963. Converted to an F.2A in 1968 and returned to service with 92 Squadron, she was retired in July 1976 and flown to Gutersloh in April 1977 to take up decoy duties as 8496M. Disposed of in 1983, she ended up with the Deutsches Luftwaffen Museum at Uetersen in 1983 and thence onward to Gatow. She's been outdoors for years and her paint is suffering accordingly; she's also engine-less, her rudder is flapping free in the wind and the pitot probe has had a hefty swipe from something leaving it pointing off at an angle. Hopefully she'll get some TLC soon.